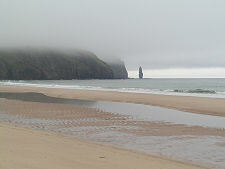 Sandwood Bay is the most magnificent beach in the UK. 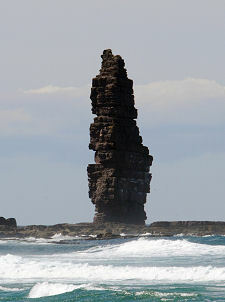 It offers nearly a mile and half of wide pinkish sand backed by huge sand dunes and a loch, and is flanked by cliffs and an impressive sea stack. It faces north west, straight into the teeth of the worst the North Atlantic can throw at it. 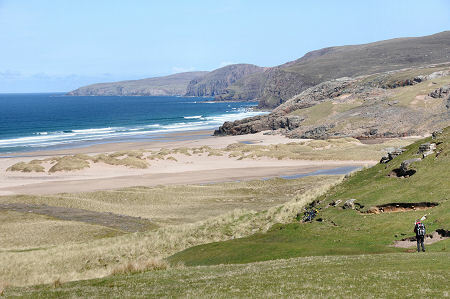 For majesty, grandeur and seclusion, there is simply nowhere that can beat Sandwood Bay. One of the things that keeps Sandwood Bay so very special is that no one gets here without expending some real effort first. The nearest approach by public road is at Blairmore, not far from Oldshoremore and a few miles north west of Kinlochbervie. 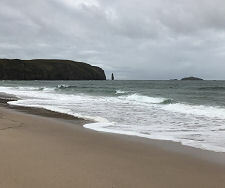 The walk to Sandwood Bay is just over four miles long (the 4½ miles stated on the gate is a little pessimistic), and has very little to commend it save the knowledge that it is taking you to the best beach in the country. 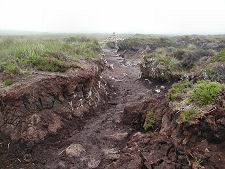 It's a gently undulating moorland route punctuated by lochs and lochans. The land rises behind the cliffs to the west and you get no view of the sea en route. Views to the east extend distantly to Cranstackie, and south east to Foinaven. But for the most part, this is four miles you simply have to cover. Underfoot conditions are generally reasonable. 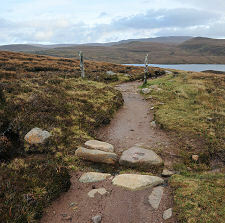 You follow a track to about the two mile point, as far as the slight descent towards Loch a'Mhuilinn. 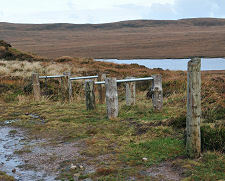 Here you find a set of bike racks, where most who have cycled this far will wish to leave their bikes. From here onwards the approach track has been turned into a good footpath complete with frequent cycle-unfriendly stone culverts to channel flowing water. 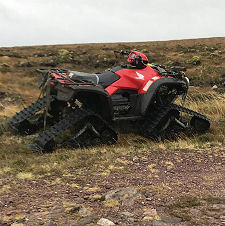 The really good news is that the stretches of path around Loch a'Mhuilinn that used to turn to peat bog after rain have been dramatically improved or bypassed. There are no false summits on a fairly flat walk like this. But as your expectations grow, the final stretch of the approach to Sandwood Bay always takes longer than you expect. You know you are almost there when the path passes between two wooden stakes driven into the ground. Shortly afterwards you crest a rise and the sound of the sea hits you at the same time as you see the views across Sandwood Loch and over to the northern end of Sandwood Bay. Then it's simply a matter of the descent over the remaining open ground and the broad expanse of dunes to get to the beach itself. If you can bring yourself to look to your right as you cross this stretch, you'll see the roofless remains of Sandwood Cottage. And you might want to watch out for the ghost of a mariner who used to knock at the windows of the cottage on stormy nights. According to one story he is all that remains of an Armada galleon that foundered here complete with its treasure and which, it is said, is still buried in the sand dunes awaiting discovery. Another version dresses him in a cap and mariner's reefer jacket and has him walking the dunes. 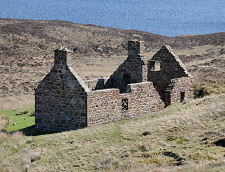 Comparing photos from different visits shows that at some point since 2010 the cottage's south east gable has collapsed, together with the chimney that topped the central wall within the building. 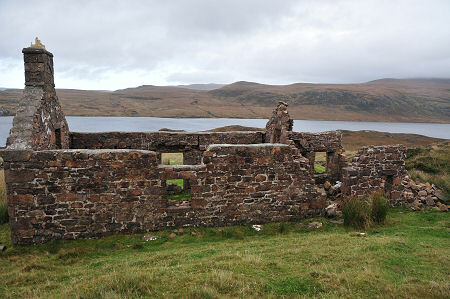 In his book "Highways and Byways in the West Highlands" published in 1935, Seton Gordon says: "I was astonished at the number of wrecks which lie on the fine sand of this bay. All of them are old tragedies: since the placing of a lighthouse on Cape Wrath just over a hundred years ago no vessel has been lost here. Some of the vessels lie almost buried in the sand far above the reach of the highest tide." 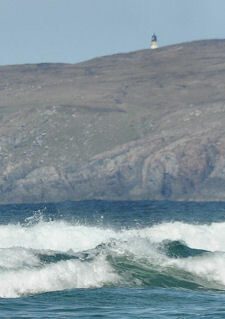 We've never found any trace of the wrecks he mentions, though the tip of Cape Wrath lighthouse, six miles away, can be seen just peering over the rising ground to the north. You might have come to Sandwood Bay to sit on a rock and watch the sea, or to explore the beach, dunes and loch, or to search for Seton Gordon's wrecks. 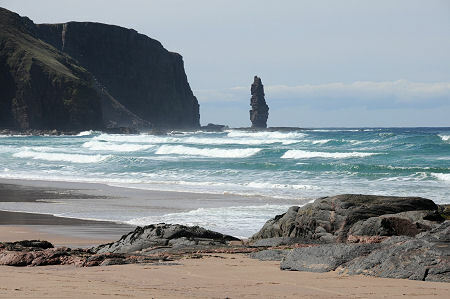 Or you might have come to explore the cliffs to the north and south of the bay, or simply while en route to Cape Wrath. Whatever your reasons, you'll know that even on a busy day you'll have plenty of space to enjoy this wonderful place in the company only of like-minded souls who have also made the trek to be here. And when you have regretfully turned your back on this superb place and made the walk back to the car park (which always seems longer than the walk out), keep a look out for the donation box placed there by the Bay's owners, the John Muir Trust. Helping them helps keep this special place special.